Multi-use venue buildings are an extreme example of buildings with flexible use. Such buildings have high occupant diversity factors and inconsistent occupant-building interaction leading to highly changeable demands of the building services. Intensive monitoring of a case study multi-use venue building was carried out in order to analyse its energy performance and identify energy saving opportunities. Results are presented from three distinct uses of the building, with each analysed as a separate case study. The analysis focused on exploring relationships between variables for each event; identifying multiple energy savings opportunities. Poor building management system (BMS) scheduling led to 49% of total gas use across all three events being estimated as waste, whereas inappropriate set points accounted for 7%. Event organiser behaviour led to 6% of total electricity across all three events estimated as waste, whereas inflexible controls accounted for 2%. Based on these results, venue building managers may find that prior knowledge of building activity and more accurate occupancy hours could yield significant energy savings through proactive energy management. For new buildings and major refurbishments, improvements in energy efficiency stemming from increasingly strict greenhouse gas emissions targets is leading to a focus on technological improvements in buildings (Escrivá-Escrivá et al. 2010; Dounis & Caraiscos 2009; Mathews et al. 2001). Part L of the UK Building Regulations is mainly concerned with carbon emissions, and hence energy consumption associated with the fixed building services, e.g. heating, ventilation, and air-conditioning (HVAC) systems, internal lighting, and hot water; all for set occupancy and operating hours (HM Government 2010). Thus, this engineering focused approach does not adequately address the interactive complexity between the building and various occupant groups, and the impact that this can have on energy use. For example, the local control of systems such as lighting, window and door openings, and small power loads, have been shown to have a significant impact on actual energy consumption through numerous studies (Rijal et al. 2009; Menezes et al. 2014; Borgeson & Brager 2008). Additionally, occupant related impacts on internal heat gains and extended hours of building use have been shown to impact energy consumption (Brown et al. 2010; Gaetani et al. 2016). However, there remains a lack of research seeking to bridge the divergence between these two research traditions. In order to provide more insight into the energy performance of multi-use buildings, it is important to understand the role of the occupants and identify wasted energy. Building occupants interact with buildings either directly through building controls or indirectly by influencing internal environmental conditions. For the latter of these, monitoring qualities such as humidity, temperature and light levels can provide a measure of the usefulness of the energy consumption from building services. It is through quantifying useful and wasted energy that it is possible to assess the energy performance of a building. Improving the understanding of the relationship baetween occupants and building systems is especially pertinent to assumptions in building energy simulation, improving building automation systems, and improving building performance as a whole (Zhao et al. 2014; Oldewurtel et al. 2013; Duarte et al. 2013). Additional complexity in the analysis of this relationship arises in multi-use buildings, where building users have numerous and more varied interactions compared to buildings with a more consistent use (e.g. offices). Venue buildings that host diverse and myriad events are an extreme example of multi-use buildings often with flexible spaces that can host a multitude of different activities resulting in high occupant diversity factors. Developing proactive energy management strategies that can meaningfully accommodate such variability can be problematic due to erratic energy consumption profiles resulting from irregular use and occupancy. Such uncertainty in energy use can limit the applicability of traditional energy analysis tools for measuring building performance. In the absence of these measures, conscientious management of building services is key to reducing energy consumption and alleviating energy related costs. Effective metering and monitoring of energy end uses, occupancy, and occupant activity can provide an understanding of where, how and why energy is used in buildings. With availability of end-use data, monitoring can enable a detailed understanding of building performance and can also identify energy saving opportunities (Wang et al. 2012). The Chartered Institute of Building Services Engineers (CIBSE) recommend that a proactive monitoring and targeting programme can help to reduce energy use by comparing it against historical data and benchmarks (CIBSE 2009). Multi-use buildings complicate this approach as even with good sub-metered data it can be difficualt to compare energy use against historical data when the user’s requirements of the building are changeable. This is exacerbated further for venue buildings as they are often used intermittently, and then for a wide variety of purposes, each with their own demands on the building’s energy use. Therefore, the usefulness of historical data can be limited in targeting energy waste and existing benchmarks such as those found in CIBSE Guide F are limited in their application (CIBSE 2004). In this paper a case study multi-use venue building is analysed in terms of the impact that changes in its use have on energy consumption. The aim of this is to examine three different uses of the building in order to identify potential energy savings opportunities, and also to identify the key variables to monitor and measure for further work. 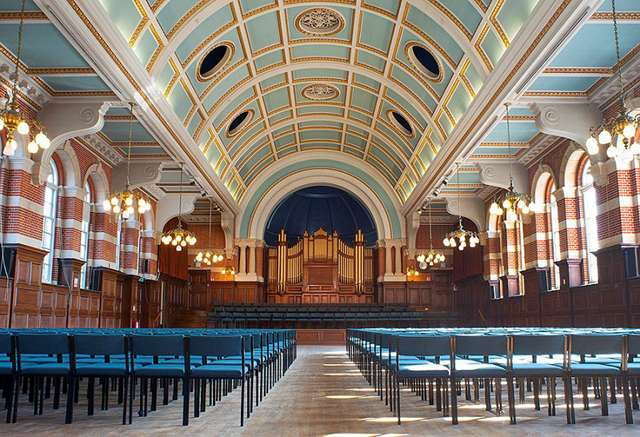 The case study building is a concert hall and a Grade II listed building situated in the UK. The large auditorium area shown in Figure 1, is used for a multitude of events including concerts, lectures, examinations, exhibitions, and ceremonies. It is used intermittently throughout the year and the frequency and intensity of its use varies seasonally. Each event can have different requirements of the space (in terms small power equipment, lighting schemes, occupant numbers, duration etc. ), and can therefore place different demands on the building services. The analysis of three different events is presented; a graduation ceremony, a ball and a concert. The interior of the case study venue building. The venue building was built in 1905 and is brick built with 19 large single glazed sash windows and a barrel vaulted ceiling running along the centre of the hall. The main auditorium measures approximately 35 m by 14.5 m, with a maximum ceiling height of 10.3 m. Since its construction an extension has been built to accommodate changing rooms and toilets, though the main auditorium remains unchanged. The masonry construction consists of solid brickwork with no cavity. Internally the ceiling is domed and externally the roof is pitched. The level of insulation in the roof is not known, however previous investigation in this area by contractors has indicated that this is minimal. The U-values of the different construction elements are unknown. The building is primarily heated through two natural gas-fired boilers located in the basement plant room, each with a maximum heat output of 115 kWth. The boilers operate concurrently rather than in duty/standby configuration and supply heat to the space through local radiators via one variable temperature (VT) low temperature hot water circuit (LTHW). Accordingly, space heating for the building is not controlled zonally. Radiators serving the main hall do not have temperature regulating valves and are concealed behind wooden panelling. In other areas of the building such as the changing rooms, radiators are fitted with thermostatic radiator valves (TRVs) which have been set to varying levels of heat output. These TRV’s can be operated by anyone using these areas of the building. Natural gas is only used for heating as hot water is provided through electric water heaters. The heating system is controlled through a building management system (BMS). The heating set point for the building is 20°C, with the BMS responding to the lowest temperature detected from environmental sensors placed around the building. Because the heating system’s LTHW circuit operates based on the lowest temperature in the building and is not zonally controlled, operation of the manually controlled TRV’s is crucial to the risk of these areas overheating whilst other areas of the building such as the main hall struggle to reach the set point temperature. Additionally, the BMS sensors are not positioned at the standard height of 1.5 m in the main auditorium area, and are instead positioned at least 2.5 m from the finished floor level. The heating operates based upon the assumption that the building is occupied from 9 am to 5 pm and the heating schedule is manually changed through the BMS to heat any events that fall outside of these hours. To allow for the building to reach temperature the BMS has a self-learning optimiser that factors in internal and external temperatures, and increases pre-heat times from a programmed minimum. The building is naturally ventilated, however, none of the 19 windows can be opened. Occupants increase the fresh air rate through opening the external double doors to the space indicated in Figure 2. For the purposes of this study the infiltration rate of the building has not been taken into account and is as yet unknown. Building floorplan showing basic dimensions of the auditorium, location of external doors within it, and location of supply (blue) and extract (red) vents on the stage for the cooling system. 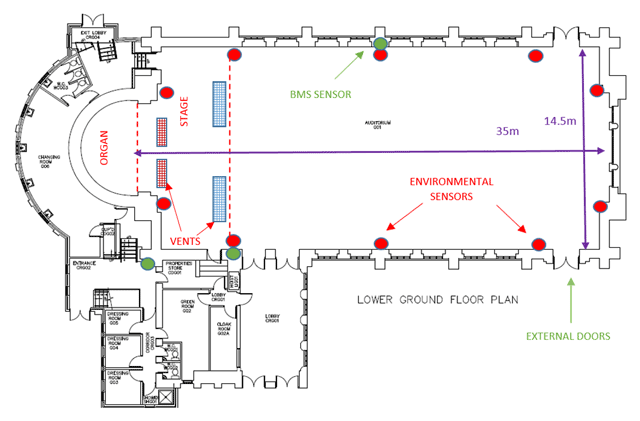 The location of BMS sensors (in green) and additional environmental sensors (red circles). There are 5 kWe air-conditioning (AC) units, the condenser units for which are located in the basement, which supply cooling to the main hall through low level vents on the stage. The cooling duty (kWth) of these systems is unknown. The AC units are not controlled through the BMS and are instead manually operated by the building manager on request by the building users. The events monitored for this research did not use these cooling units. Artificial lighting is the main permanent electrical end use in the main hall and is supplied through a variety of fittings. These are listed in Table 1. Lighting is controlled through manual switches. There are no passive infra-red (PIR) sensors to control lighting based on occupancy in any part of the building. The large windows allow natural light into the space and light fittings do not have any daylight dimming or manual dimming capability. Main lighting fittings in the auditorium. The main hall has some permanently installed small power equipment such as fire alarm and security systems, wireless routers, and a small audio visual system. However, during events it is typical for small power equipment to be introduced to the space by the event organisers for a variety of uses e.g. fridges for a temporary bar e.g. additional audio equipment, fridges and additional lighting. Further electrical end-uses are found in the rest of the building such as a humidifier for the organ and electrical point-of-use hot water heaters for hand washing facilities. Through an audit process it has been possible to identify the electrical demand from individual end-uses and establish a benchmark for baseload consumption. The building had a metered gas supply that is only used to supply the two gas-fired boilers. Data for the gas meter is stored on the BMS and is available at half hourly resolution. The main electrical incomer to the building is separately metered. There is no separate sub-metering for any of the building’s electrical end-uses. Electricity data is stored on the BMS and is available at a 5 minutely resolution. Occupancy for the building is highly variable and event specific. It is empty outside of the hours that it is used for events. The maximum seated capacity is approximately 600 people, however for some events this can be lower depending on the set up of the room. Levels of activity by the occupants can also vary. Some events such as dances can have very high levels of activity from occupants whereas other events such as concerts or lectures can have more sedentary occupants. The impact on internal heat gains from occupants and requirements for additional ventilation is consequently event specific. In addition to standard metrics for performance analysis, such as metered energy data and environmental conditions, direct observations of occupant activity and estimates for internal heat gains were used to provide essential context to the analysis. In order to have an accurate record of building activity and the timings that electrical end uses, such as lighting and small power were used, the researcher ensured that they were the first occupant of the building. It was ensured as much as possible that the researcher had a good line of sight to all entry and exit points to the building to monitor occupancy, and also knowledge of lighting and small power use in other areas of the building. This necessitated the need to walk around the building at specific times during an event e.g. an intermission during a concert. At other times it was possible to sit at the back of the hall and observe the event as backstage areas were unoccupied e.g. during a concert performance. As the building is not sub-metered, a detailed energy audit process following CIBSE’s TM22 (CIBSE 2006) was used to monitor the electrical end uses for each event. The use of different individual end uses was noted by the researcher as they came on and offline. A previous energy audit carried out by the researcher using the building level electricity meter identified the electricity consumption of individual end uses such as different lighting fixtures, specific permanent small power devices, the cooling units, and the space heating VT pumps. This was used to estimate an energy end use breakdown for each event that enabled the creation of an event specific five minutely electricity consumption profile per end use. For small power, where additional equipment was brought in by event organisers the power rating of these devices was obtained from each item and a load diversity applied to their use. Gas consumption was obtained from the BMS in half hourly time periods. As gas consumption data was not in the same resolution as wider data collected for this research, e.g. electricity consumption, each half hourly period of gas use was divided into six equal quantities, thus presenting the data in five minutely periods. This is a recognised limitation in the research as each five minutely period is not an accurate representation of the true gas consumption at that time, however it enables this data to be analysed against the wider variables monitored. The monitoring for these events was carried out in November and December 2016 which had a preheat time programmed into the BMS of four hours and five hours respectively. The internal environment was monitored using HOBO U12-012 environmental sensors. Each sensor is pre-calibrated by the manufacturer and capable of logging temperature, relative humidity and lux levels. The sensors were placed at a height of 1.5 m as per industry recommendations and literature (Krausse et al. 2007; CIBSE 2016), and on wall panels known to not have radiators behind them. In order for the sensors to cover as much of the internal area as possible the sensors were placed 5 m apart from each other. Figure 2 shows the location of these sensors in red circles. There was not an appropriate location for sensors to be placed in the centre of the hall. External weather data was obtained from a local weather station and included temperature, relative humidity and levels of solar radiation. Occupancy was noted every five minutes by direct observations of entry and exit points to the building along with a brief description of occupant activity. At specific times during an event e.g. an intermission during a concert it was necessary for the researcher to walk around the building to make continued observations of occupancy. At other times it was possible to sit at the back of the hall and observe the event as backstage areas were unoccupied e.g. during a concert performance. Occupancy numbers were cross checked with event organisers in order to verify the researcher’s counting method. Observations of occupant activity were noted in order to calculate occupant related internal heat gains. Additional observations were also made relating to occupant clothing to provide context to the data. Direct observation of occupant interaction with energy consumption was noted where possible to provide insight into why energy was being used. An example of this could be the time that chandelier lights were turned on and if this was because lighting was required to perform a task, or if this was because the chandelier lights being on was visually pleasing to the occupants. The focus of the monitoring presented was in the main hall (labelled as “Auditorium” in Figure 2) of the building. In terms of what is classified as an event in this research, the whole 24 hour day in which an event was held is presented in the monitoring. In terms of occupied hours for each event, this was taken as the hours from when any occupants arrived to the hall engaging in tasks relevant to hosting the main event for an audience later that day, to when the hall was vacated and no longer in use. Table 2 shows an overview of the three different events monitored. The total hours of occupancy were similar for each event. The concert organisers arrived at 11:15 to set up the hall for the evening event. There was then a rehearsal in the early afternoon followed by an evening performance. The event organisers for the ball arrived slightly later on the day at 11:45, with the main evening event starting around 19:00. The graduation ceremony event organisers arrived at 07:00 to set up and the first ceremony was at 09:00. In terms of the requirements that each event had on the electrical end uses, the graduation ceremony and concert had similar requirements from the artificial lighting, with the only difference being that the concert did not use the fluorescent strips in the coving. In comparison, the ball used much lower levels and only used some of the chandeliers and stage spotlights. Each event also used varying levels of small power. With the concert only having acoustic instruments there was no small power used. The ball had comparatively high levels of small power as additional sound systems and used electronic amps for instruments. The graduation ceremony used some small power that was mainly audio and recording equipment. The heating was in use for all three events. Additional artificial cooling was not used for any event; however it was observed that during the ball external doors were opened to allow cooler fresh air intake. Overview of the three events monitored. Concert 11:15 22:15 11:00 280 Held in November. Evening concert with afternoon rehearsals. No small power use. High levels of lighting use. Performers sang or played acoustic instruments. Ball 11:45 23:45 12:00 180 Held in December. Evening dance involving all occupants with high levels of occupant activity. High levels of small power, mainly audio equipment. Low levels of lighting use. Graduation 07:00 19:55 12:55 592 Held in December. Five separate graduation ceremonies held throughout the day. Hall reached maximum occupancy. High levels of lighting use. A breakdown of energy use for each event is provided in Table 3. Overview of energy use from each monitored event. Total gas and electricity are presented from the building level metering. Lighting and small power electricity consumption is only for the main hall area of the building. In terms of gas consumption the graduation ceremony used the least as for this event the heating was only on in the morning, compared to it being on all day for the other events. The heat to the hall was calculated by factoring in the estimated boiler efficiency (88%) and the proportion of the total heated volume of the building represented by the main hall. It is recognised that greater accuracy in heat output to the hall area could be achieved through measuring each radiator within that space, however it was not possible to access these as they are behind fixed wooden panelling. In terms of electricity use, the building level electricity consumption also includes end uses that are not in the main hall such as a fridge, hot water heaters, and lighting and other small power for the remainder of the building. Therefore, this consumption is higher than the sum of lighting and small power presented that is hall specific. Small power consumption in the main hall was lower than lighting for all events with the exception of the ball. The peak small power electrical demand for this event was 2.1 kW amounting to 15.1 kWh over the period of use, primarily due to the use of speakers. As expected from direct observations, the graduation ceremony had the highest artificial lighting demand and over the duration of the event used an estimated 65.5 kWh of lighting related electricity. The ball had the lowest lighting related electricity demand using an estimated 9.1 kWh of lighting related electricity in its duration, which is partly because additional battery powered coloured LED lights were used by event organisers instead of the existing lighting. Examining lighting related electricity use in more detail, Figure 3 shows average illuminance levels for the hall, occupancy and estimated lighting loads for the concert. Internal lux levels, estimates on lighting load and occupancy for the monitored concert. Specific points of interest are highlighted as follows: A – Event organisers arrive to set up the hall, B – rehearsals with a brief break, C – main concert starts with guest’s arrival, D – Intermission, E – additional lighting turned on due to falling light levels, F – sunrise, G – artificial lighting turned on, H – Light levels begin to fall due to external weather becoming more overcast. The concert itself started at 19:30, with rehearsals earlier in the day. Additional lighting was switched on at 14:25 to compensate for low levels of natural light due to changing weather conditions. However, illuminance levels before lights were switched on at 11:00 were similar to those once the sun had set around 16:05, indicating that the use of artificial lighting before 14:25 was in fact unnecessary, thus generating waste. The shaded area in Figure 3 shows the potential energy waste that could have been avoided, amounting to 15.3 kWh or 26.3% of total estimated lighting energy, had the artificial lighting been aligned more in response to required average illuminance levels for occupant tasks rather than the user’s expectations of the space. Moreover, during the performance, it is argued that the measured illuminance levels of 80 lux were not necessary for the entire hall as the audience area did not need to be as brightly lit as the stage area. At approximately 17:50, prior to the evening performance, the event organisers tried to adjust lighting levels, reducing the number of floodlights in use to those only above the musicians, but the current wiring set up meant that this was not possible. The switches for the chandeliers and floodlights, both of which were used during this event, serve pairs of luminaires which are not always next to each other. As a result, the lighting set up is not flexible enough to only light certain areas of the hall to a defined level of illuminance and enable the occupants to achieve their desired lighting levels. Assuming a greater flexibility in lighting controls, switching off the six chandeliers and six floodlights directly above the audience during performance times could amount to an additional saving of 9.2 kWh of estimated lighting related energy waste. Consequently, the total amount of lighting waste identified for this event amounts to 24.5 kWh or 42% of total estimated lighting use. In addition, if the lights had a simple dimmer function, then for certain tasks or activities, further savings could be attained though it is not possible to estimate the potential savings here. Figure 4 shows the estimated lighting related energy use for the graduation ceremony. Organisers arrived before sunrise and turned on some artificial lighting (point F). Between 11:00 and 15:00 levels of illuminance suggest that the amount of natural daylight could have compensated for some of the artificial lighting’s use, however artificial lighting use during this period remained the same in order to present the lighting design that event organisers had chosen for this event. However, light levels could still have been adjusted in the lunch hour between 13:00 and 14:00 when the hall was not occupied. In observing the activity of the occupants, it is likely that higher levels of illuminance were also required to facilitate filming during this event. Once the event had finished the additional artificial lighting turned on at points G and H was not turned off. Levels of illumination had been sufficient in the morning prior to sunrise for the event organisers to prepare for the event. These light levels should also have been sufficient for the event organisers to close down the event at the end of the day. Hence, after the last event finished the use of additional artificial lighting, being the cove lighting and floodlight use amounting to 13.6 kWh or 21% of total estimated lighting use, could be considered wasted energy. Internal lux levels, estimates on lighting load and occupancy for the monitored graduation day. The five large changes in occupancy refer to the five separate ceremonies held that day. Specific points of interest are highlighted as follows: A – Event staff arrive, B – First ceremony begins, C – Last ceremony ends, D – Sunrise, E – Sunset, F – Chandeliers on, G – Cove lighting and stage spotlights on, H – Floodlights on, I – All lighting turned off. Figure 5 shows the levels of illuminance and estimated lighting load for the ball. In contrast to the concert, throughout the day this event’s organisers relied on natural light whilst they were setting up for the event. Artificial lights were only turned on after the sun had set. In addition to the artificial lighting already present in the building, as part of the lighting design, event organisers also used pre-charged battery powered LED lights that were able to change colour. In terms of energy waste, very little lighting waste is obvious. Lights were turned off soon after the event finished and levels of lighting in use throughout the event were much lower than the other two events that had been monitored. Overall, during the ball the level of illuminance stayed at approximately 10 lux, part of which was due to the use of pre-charged coloured LED lights. This is compared to an average of 130 lux during the graduation ceremony (which also included daylight) and 80 lux during the concert. In all events lighting was used to make the hall visually appealing as well as provide useful levels of light, however the use of individual lighting fixtures could be questioned through examining other similar events. Internal lux levels, estimates on lighting load and occupancy for the monitored ball. Specific points of interest are highlighted as follows: A – Event organisers arrive, B – Evening guests begin to arrive, C – Guests begin to leave, D – Sunrise, E – Sunset, F – Some stage spotlights and some chandeliers turned on, G – More stage spotlights turned on and some chandeliers turned off, H – All lights turned off. Lighting and small power use also contributed to internal heat gains. Table 4 shows estimates of total internal heat gains from lighting, small power, and occupants for each event. The occupant related internal heat gains were calculated based on observations of activity and occupancy, and guidelines found in CIBSE Guide A (CIBSE 2016). Despite having 100 fewer people, the occupant related heat gains from the ball were similar to the occupant related heat gains from the concert, showing the impact occupant activity can have on potential temperature rise in the building. What is also clear from this table is that occupant related heat gains were far greater than lighting and small power related gains. Maximum average temperature and gas related heat to the main auditorium with estimations of internal heat gains from occupants, lighting and small power. Figure 6 shows the variation of internal temperature throughout the ball with reference to external temperature, occupancy, occupant related heat gains and heat from the gas fired LTHW circuit. That the temperature set point was achieved only once occupant related internal heat gains increased during the main event in the evening is testament to the impact that these have on the internal environment. The temperature set point was achieved as occupancy levels rose and internal heat gains increased. Observations of the occupants themselves during the evening event showed behaviour that indicated they were too hot, and that the doors were being opened in response to this. The heating continued to stay on during this time and gas consumption fluctuated throughout the evening event, correlating with the use of external doors for ventilation purposes. Had the set point temperature been lower the heating system would not have continued to try and heat the room and it is possible that occupants would have been more comfortable with the room at a lower temperature. The shaded area identified in Figure 6 amounting to 154.7 kWh of total heating related energy into the hall area, shows the potential saving if the building management system had been scheduled to allow a lower temperature during the main evening event, thus avoiding the need for heating during this period. As the building is not zonally controlled, in order for this heating to be avoided the heating for the whole building will also need to be turned off. In this eventuality gas savings for the building as a whole will be higher, amounting to 197 kWh or 15.3% of total gas used that day. Internal and external temperature, occupancy and heat from gas during the monitored ball. Specific points of interest are highlighted as follows: A – Heating on, B – Heating begins to plateau, C – Heating use fluctuates, D – Guests begin to arrive for the main event, E – Guests mostly dancing, F – Band have a break from performing, G – Guests leave, H – Temperature drop due to external door opening, I – Set point temperature achieved. Prior to the evening event the temperature set point was not met, and was only achieved once occupancy and occupant activity increased. This is potentially due to external doors being left open by event organisers during the set up period leading to increased heat losses, behaviour that demonstrated that they were less concerned with their thermal comfort. In terms of identifying energy waste, this event could demonstrate how the current assumed occupancy schedule for the heating system is inappropriate, as it was only continuously occupied from 14:00 onwards. Recognising that the event organisers were less concerned with their thermal comfort, it is arguable that the heating coming on could be delayed, based on the known arrival time of guests to the evening event at 19:00. Therefore, acknowledging that the programmed pre-heat time for the BMS is five hours, it is arguable that the heating start time can be rescheduled to 14:00, five hours before the evening event, a total delay of six hours. This would amount to a heating related energy saving of 268 kWh of heat, or 30% of gas used that day. Considering the previous heating waste identified for this event, this amounts to a total of 465 kWh of heating related energy, or 45% of total gas used that day. This saving is assuming that the drop in external temperature from approximately 15:00 does not impact the internal temperature, and that the steady, continuous rise in internal temperature as observed between 08:00 and 14:30 would would be repeated later in the day. However, without a better understanding of thermal losses through both open doors and the building fabric, an accurate quantification of this heating related waste and the impact that a delay in heating would have on evening internal temperatures is not possible. Figure 7 shows that for the concert, the average internal temperature only exceeded the temperature set point by an average of 0.1°C. A maintenance issue with the BMS meant that the heating did not come on until after 09:00 when it was manually turned on after being off the entirety of the previous day. This meant that the internal temperature dropped to below 14°C. Examining the heating related energy use and activity in the hall, the only identifiable heating related waste was the drop in internal temperature at point G, where the event organisers had left external doors open. Because of this behaviour, it is possible to suggest a delay in the heating system coming on, especially as the internal temperature once the doors were closed was similar to the internal temperature prior to the heating coming on. This delay would see a saving of 326 kWh of heating related energy, or 40% of gas use that day. Internal and external temperature, occupancy and heat from gas during the monitored concert. Specific points of interest are highlighted as follows: A – Heating comes on, B – Heating turns off, C – Event organisers arrive, D – Performers arrive for rehearsals, E – Guests arrived for evening performance, F – Guests leave at end of concert, G – Internal temperature drops as external doors are left open, H – Set point temperature is achieved. The temperature in the room struggled to meet the set point temperature and only did so towards the end of the concert, demonstrating the reliance on internal heat gains to reach this temperature. Although thermal losses through the building fabric are yet to be quantified, the internal temperature and heating use indicates that this building struggles to meet the set point temperature if the internal temperature drops below a threshold minimum without the additional heat from occupants. Compared to the day of the ball, where the external temperature dropped below 5°C in the morning, the internal temperature that day did not fall below 16.5°C because the building had retained some of the heat from the day before. This event had 100 more people in the room than the ball, and external doors were largely kept closed during the event itself. However the level of activity of the occupants attending the concert was lower, meaning overall occupant related heat gains were very similar for the two events. This demonstrates the sensitivities of the building to variations in occupant activity. Figure 8 shows the variation of internal temperature throughout the graduation ceremony with reference to external temperature, occupancy and heat from the heating system. By 8:30 am the heating system automatically switched off in response to the BMS temperature sensors recording that the set point had been achieved. The internal temperature continued to rise. There is a clear correlation with internal temperature and occupancy, indicating that occupant related heat gains contributed to the temperature rise. The temperature fall at periods of low occupancy was exacerbated through the opening of external doors to allow people to enter and exit. Drawing upon this evidence, it is argued that the internal heat gains from occupants and lighting led to the building markedly exceeding its heating set point temperature. Examining the period of time that the internal temperature exceeded the set point, the increase in temperature above the set point translates to 258.5 kWh of energy. It has been estimated that the amount of energy used to heat the building in the morning was 215 kWh. Therefore, 100% of this energy could be considered as waste. This amounts to 311 kWh of gas that was combusted that day to heat the whole building. In examining a lower set point temperature for this event, the overnight internal temperature did not fall below 18°C, which as mentioned previously is adequate for many other building types. In this circumstance the heating would not come on. Internal and external temperature, occupancy and heat from gas during the monitored graduation day. The five large changes in occupancy refer to the five separate ceremonies held that day. Specific points of interest are highlighted as follows: A – Heating turns on, B – Heating starts to turn off, C – Heating is off, D – first ceremony starts, E – Staff on lunch break, F – Last ceremony finishes, G – Staff finish packing up and exit building, H – Set point temperature reached, I – Temperature fluctuates with occupancy and doors opening. Examining all events, in terms of heating the data shows that there are implications for the BMS scheduling and temperature set points on the comfort of occupants dependant on their levels of activity. For electricity, some lighting waste has been estimated based on lux levels and occupant activity. It was not possible to definitively identify small power waste without plug monitors on each device, although it was observed during the monitoring of these events that these devices were mostly only plugged in when they were required. Table 5 provides an overview of the total waste identified during each monitored event. In total a potential saving of 38.1 kWh of electricity in the form of lighting and potential saving of at least 1368 kWh of gas was identified. With reference to Table 3 examining the total energy use across all three events, this represents approximately 8% of electricity consumption and 49% of gas consumption. For heating energy, the figure for the concert and the higher figure for the ball are estimates that that do not take into account the impact of thermal losses on internal temperatures. Total energy waste and potential electricity and gas savings identified during each monitored event. Table 6 categorises the different types of waste identified. Lighting waste can be broadly classified into two types, event organiser behaviour and inflexible controls. For the first category, event organisers chose to use excessive amounts of lighting when it was not necessary. In the case of inflexible controls, event organisers or clients hiring the space were unable to alter the lighting set up for lower electricity consumption due to a lack of dimming capability or limitations on which lights could be turned on/left off. Identified electricity and gas waste by category. In terms of heating, the waste was both due to inappropriate set point temperatures and poor BMS scheduling, the latter of which was responsible for 49% of heating related waste. The chosen set point temperatures did not take into account internal heat gains or the varying comfort needs of the occupants depending on their level of activity. It is clear from Table 6 that poor BMS scheduling contributed to the majority of heating waste as the time that the hall was required to reach the set point temperature was much later than the BMS had optimised for. In reality, heating related energy waste could arise due to a combination of the two reasons identified. For example, for the graduation ceremony, the decision to use the heating meant that the heating was scheduled to come on when it was not necessary. In addition to this an inappropriate set point led to heating being on when internal heat gains could have compensated for its use. A lower set point would have meant the heating did not come on at all, with the potential for the original set point temperature of 20°C still being achieved through internal heat gains. As the building is not zonally controlled, choosing not to heat or delaying heating for the hall would also impact the wider building. Further environmental monitoring of other areas of the building would be required to determine the impact of these energy conservation measures on internal temperatures. This research presented an initial analysis of three different events hosted in the same multi-use venue building during the heating season. Results indicate that prior knowledge of occupant activity could enable the building manger to reduce heating related energy waste by selecting appropriate set point temperatures that are event specific or scheduling the BMS more appropriately to actual occupancy hours. By adopting these measures this analysis suggests potential gas savings between 15–100% for different event types. Examining total gas use across all three events, poor BMS scheduling led to 49% of gas use estimated as wasted, whereas inappropriate set points accounted for 7%. In addition, although not as significant in terms of overall energy waste, there are still savings to be made by using lighting more sensitively to levels of illuminance necessary for a task. A combination of event organiser behaviour and inflexible building controls led to potential savings of between 6.4–16.3% for individual events. For total electricity use across the three events, event organiser behaviour led to 6% of electricity estimated as waste, whereas inflexible controls accounted for 2%. As this research has only considered three events in the building’s calendar year, it will be necessary to incorporate the findings from this monitoring into wider knowledge of the building’s use and energy consumption in order to have a better understanding of building performance. In addition it would be valuable to examine how the building’s thermal properties and intermittent use impact on overall energy use. With a larger data set it would also be possible to carry out multi-linear regression analysis to determine with greater confidence which independent variable has the most impact on energy, consequently enabling building managers to focus energy conservation activities. The researchers would like to thank the University of Reading’s Estates and Facilities Team, The Events Team, the BMS manager and the building porters for allowing access to the building as well as valuable information on its use and management. In addition, the researchers would also like to thank the Engineering and Physical Sciences Research Council for funding this research. Borgeson, S and Brager, G 2008 Occupant control of windows: accounting for human behaviour in building simulation. Center for the Built Environment. CIBSE 2004 Guide F: Energy efficiency in Buildings. London: Chartered Institution of Building Services Engineers. CIBSE 2006 TM22 Energy assessment and reporting method. London: Chartered Institution of Building Services Engineers. CIBSE 2009 CIBSE Guide H: Building control systems. London: Chartered Institution of Building Services Engineers. CIBSE 2016 CIBSE Guide A: Environmental design. London: Chartered Institution of Building Services Engineers. Duarte, C, Van Den Wymelenberg, K and Rieger, C 2013 Revealing occupancy patterns in an office building through the use of occupancy sensor data. Energy and Buildings, 67. HM Government 2010 Part L2a Conservation of fuel and power. London.